Tipperarylive can exclusively reveal that Councillor David Doran, after much soul searching, has resigned from Sinn Fein after 25 years, stating that the party is not the one he joined when he was in college. The Thurles based councillor, who cut his teeth in politics as a member of Thurles Town Council initially, and then as a member of the amalgamated Tipperary County Council, said that there is an element within the party that he did not wish to be associated with and he pointed also to “determined efforts to undermine the local party set-up” - the Robert Emmet Cumann, of which he is a founding member and up the point of his resignation, chairman. In a statement issued to us this evening, Cllr Doran said that he had felt ostracised for the past number of years from the party on a number of issues, including his tough stance on criminality. “I had been advocating to get much tougher with these vicious thugs and criminals for example by denying them free legal aid, tag them, give them longer sentences , in cold basic cells without flatscreen TVs etc..this stance though wasn’t supported by Sinn Fein which had a more rehabilitative outlook when dealing with such criminals and in my opinion was a much more softly softly approach which focused much on the criminal and their hard upbringing and little on the many victims of rural crime and this I absolutely felt is very much at odds with both my own and the general publics view,” he said. “I was the first public representative to speak out about this and call it for what it was and my opinion has not changed - it’s shameful that our Council is involved in such pandering and placating to anyone. My view is allocate the houses to whom they were promised and if they don’t want them give them to someone else, end of story and what’s nearly as bad is the current mediation process which is also costing the taxpayer but in any case Sinn Fein particularly here locally had a much more tolerant view which seemed to support the argument that would facilitate the special arrangement which in turn meant the houses would be left unoccupied while so so many people are desperate to be housed. Any public representative worth their salt couldn’t support that narrative,” he said. 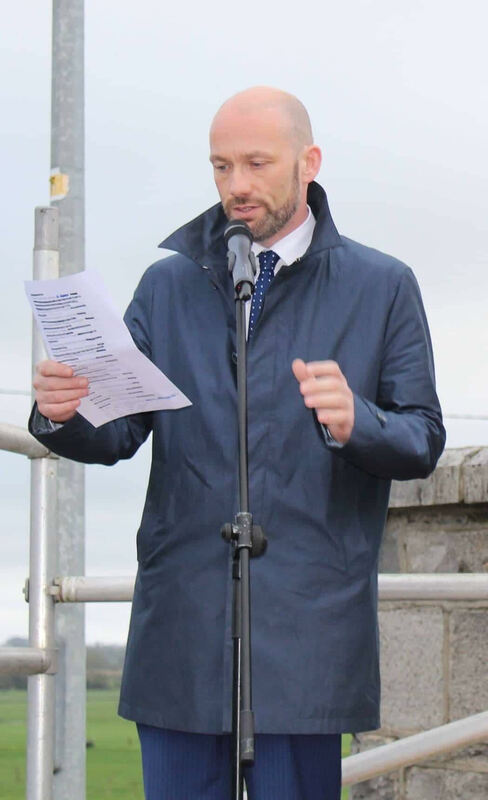 Cllr Doran speaking at Sologheadbeg last weekend. “Now there will always be a breaking point and a straw that breaks the camels back and for me it was the shameful way both myself and our local Cumann were treated recently by the party. Just to briefly outline events - I had been put forward and selected late last year by our local Robert Emmett Cumann to be their candidate for the local elections this May and I had all my papers submitted. A,then on the eve of Christmas, I was told by those more senior in the party that my candidacy was been challenged and that some rogue elements within the party, who for a while now as I had referenced earlier, had set about undermining our Cumann and political work of late, were challenging the convention, but were been persuaded not to by the chair of Tipperary Sinn Féin, by all the councillors and by senior members of the party in Tipp because they all had felt it was being done for the wrong reasons which was part of the campaig to undermine the work that I had been doing. But, they weren’t for changing. Cllr Doran went on to say that he has helped to build up Sinn Féin in this area of Thurles and the surrounding parishes for many years and was wasn’t going to go on with that kind of ill feeling and bad blood, adding that there are other matters too which he didn't like but would not get into at this point in time. “Finally I would like to thank my family and friends and loyal supporters who have always stuck by me, my former Cumann colleagues in the Robert Emmet Cumann in Thurles, fellow party councillors in Tipp and all who have supported me for many years. But, above all else I want to thank the people of Thurles and the surrounding parishes who have voted for me and supported me in many an election, something I have never taken for granted and always very much appreciated. They have always been so courteous and welcoming to me on their doorstep and out and about or wherever and whenever we meet. “I want to say with my hand on my heart, it’s always been my great pleasure and privilege to be your representative and I am going forward as an Independent candidate in the upcoming local elections this year where I will be respectfully asking you for your vote and support and it may be true that elements within the Sinn Séin party don’t want me to be their candidate, but maybe the people of Thurles and the surrounding parishes do want me to be theirs. In any case you can rest assured that David Doran will be going before the people on May 24th, seeking a mandate to continue on doing the work I enjoy doing day-in day-out and that’s serving my community,” he said.